(PM) Berlin, 16.04.2012 - PCS Power Converter Solutions has signed a supplier contract with Suzlon Wind Energy South Africa (Pty) Ltd. to supply Green Line 1000 reactive current converters for the Suzlon Cookhouse Project in the East Cape province of South Africa. Cookhouse is the largest wind energy project in South Africa. PCS is supplying 66 converters in total for the Suzlon S88 Wind Turbines to comply with feed-in regulations. The planned wind farm should generate a total output of 135 MW. Suzlon already received the go-ahead from the South African Minister for Energy in December of last year to start delivering the S88 wind turbines, each with an output of 2.1 MW, for the Cookhouse Wind Energy Facility project. The Cookhouse project is named for the planned location of the wind farm. Cookhouse is a small city in the South African Eastern Cape province in the southwestern part of the Republic. The planned wind farm is one of South Africa’s leading wind energy projects. Already approved by the Department of Environmental Affairs, up to 200 wind turbines may be constructed in the future, which would produce enough energy to power 88,000 homes. For South Africa, this is an important step in the direction of a future-oriented power supply that places the same requirements on wind turbine and grid operators as in Europe. The accelerated development of renewable energies requires power stations to provide more adaptable grid-supporting functions in the form of so-called “grid codes” or feed-in regulations. The Cookhouse project is the latest wind farm required to comply with these new regulations. 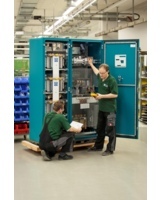 Compliance was achieved quickly and efficiently with PCS Green Line 1000 reactive current converters. Integrated into the S88 from Suzlon, the PCS converters enable grid support during voltage drops, making the wind turbine compliant with fault ride through regulations. The entire system, comprised of the S88 from Suzlon and the Green Line 1000, has already received the relevant certification for proof of grid compatibility from Germanischer Lloyd. The Green Line 1000 converters have already proven themselves in real-world tests in systems from various manufacturers with a total of 130 MW. Stricter grid connection requirements are currently being developed in many countries. These grid codes ensure that, on the one hand, older wind turbines are upgraded to continue to receive subsidies or to be able to feed in energy in the first place. On the other hand, new systems are also affected, because these require proof of compliance with the grid codes in order to receive construction authorization. For this reason, PCS provides Green Line 1000 reactive current converters for upgrades in two performance classes. They are suitable for both smaller and larger wind turbines up to 2500 A and consist of a pulsed IGBT power converter with a voltage link. If the grid is operating under nominal conditions, the converters remain in stand-by mode. If the voltage on the grid drops, the converters are activated and supply the required reactive current for up to six seconds. A Dynamic Team with a Wealth of Experience PCS is a dynamic, independent company with vast experience, about 220 expert staff, and a turnover of 50 million Euros. 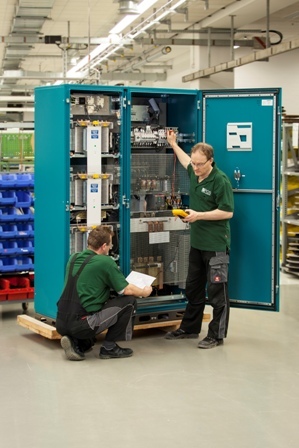 More than 70,000 times, PCS power converters made in Berlin have braved the tough service conditions of rail deployment (PCS Rail) and highly dynamic industrial requirements (PCS Blue Line). Since 2005, PCS also brings a fresh breeze into power generation from wind energy. With more than 1400 units deployed, PCS Green Line power converters achieve peak performance for wind turbines – featuring user-friendly design, excellent control technology, life and simulated test runs, comprehensive project management, and all-round service.